Transmission of color images using mechanical scanners had been conceived as early as the 1880s. A practical demonstration of mechanically-scanned color television was given by John Logie Baird in 1928, but the limitations of a mechanical system were apparent even then. Development of electronic scanning and display made an all-electronic system possible. Early monochrome transmission standards were developed prior to the Second World War, but civilian electronics developments were frozen during much of the war. In August 1944, Baird gave the world's first demonstration of a practical fully electronic color television display. In the United States, commercially competing color standards were developed, finally resulting in the NTSC standard for color that retained compatibility with the prior monochrome system. Although the NTSC color standard was proclaimed in 1953 and limited programming became available, it was not until the early 1970s that color television in North America outsold black and white or monochrome units. Color broadcasting in Europe was not standardized on the PAL and SECAM formats until the 1960s. Broadcasters began to switch from analog color television technology to digital television around 2006. This changeover is now complete in many countries, but analog television is still the standard elsewhere. The human eye's detection system, which is in the retina, consists primarily of two types of light detectors: rod cells that capture light, dark, and shapes/figures, and the cone cells that detect color. A typical retina contains 120 million rods and 4.5 million to 6 million cones, which are divided among three groups that are sensitive to red, green, and blue light. This means that the eye has far more resolution in brightness, or "luminance", than in color. However, post-processing of the optic nerve and other portions of the human visual system combine the information from the rods and cones to re-create what appears to be a high-resolution color image. The eye has limited bandwidth to the rest of the visual system, estimated at just under 8 Mbit/s. This manifests itself in a number of ways, but the most important in terms of producing moving images is the way that a series of still images displayed in quick succession will appear to be continuous smooth motion. This illusion starts to work at about 16 frame/s, and common motion pictures use 24 frame/s. Television, using power from the electrical grid, tunes its rate in order to avoid interference with the alternating current being supplied – in North America, some Central and South American countries, Taiwan, Korea, part of Japan, the Philippines, and a few other countries, this is 60 video fields per second to match the 60 Hz power, while in most other countries it is 50 fields per second to match the 50 Hz power. In its most basic form, a color broadcast can be created by broadcasting three monochrome images, one each in the three colors of red, green, and blue (RGB). When displayed together or in rapid succession, these images will blend together to produce a full-color image as seen by the viewer. One of the great technical challenges of introducing color broadcast television was the desire to conserve bandwidth, potentially three times that of the existing black-and-white standards, and not use an excessive amount of radio spectrum. 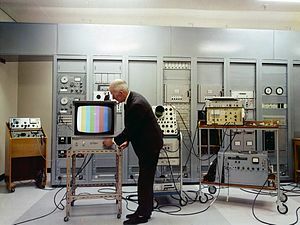 In the United States, after considerable research, the National Television Systems Committee approved an all-electronic system developed by RCA which encoded the color information separately from the brightness information and greatly reduced the resolution of the color information in order to conserve bandwidth. The brightness image remained compatible with existing black-and-white television sets at slightly reduced resolution, while color televisions could decode the extra information in the signal and produce a limited-resolution color display. The higher resolution black-and-white and lower resolution color images combine in the eye to produce a seemingly high-resolution color image. The NTSC standard represented a major technical achievement. Experiments in television systems using radio broadcasts date to the 19th century, but it was not until the 20th century that advances in electronics and light detectors made development practical. A key problem was the need to convert a 2D image into a "1D" radio signal; some form of image scanning was needed to make this work. Early systems generally used a device known as a "Nipkow disk", which was a spinning disk with a series of holes punched in it that caused a spot to scan across and down the image. A single photodetector behind the disk captured the image brightness at any given spot, which was converted into a radio signal and broadcast. A similar disk was used at the receiver side, with a light source behind the disk instead of a detector. A number of such systems were being used experimentally in the 1920s. The best-known was John Logie Baird's, which was actually used for regular public broadcasting in Britain for several years. Indeed, Baird's system was demonstrated to members of the Royal Institution in London in 1926 in what is generally recognized as the first demonstration of a true, working television system. In spite of these early successes, all mechanical television systems shared a number of serious problems. Being mechanically driven, perfect synchronization of the sending and receiving discs was not easy to ensure, and irregularities could result in major image distortion. Another problem was that the image was scanned within a small, roughly rectangular area of the disk's surface, so that larger, higher-resolution displays required increasingly unwieldy disks and smaller holes that produced increasingly dim images. Rotating drums bearing small mirrors set at progressively greater angles proved more practical than Nipkow discs for high-resolution mechanical scanning, allowing images of 240 lines and more to be produced, but such delicate, high-precision optical components were not commercially practical for home receivers. It was clear to a number of developers that a completely electronic scanning system would be superior, and that the scanning could be achieved in a vacuum tube via electrostatic or magnetic means. Converting this concept into a usable system took years of development and several independent advances. The two key advances were Philo Farnsworth's electronic scanning system, and Vladimir Zworykin's Iconoscope camera. The Iconoscope, based on Kálmán Tihanyi's early patents, superseded the Farnsworth-system. With these systems, the BBC began regularly scheduled black-and-white television broadcasts in 1936, but these were shut down again with the start of World War II in 1939. In this time thousands of television sets had been sold. The receivers developed for this program, notably those from Pye Ltd., played a key role in the development of radar. 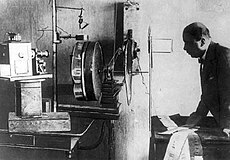 By 22 March 1935, 180-line black-and-white television programs were being broadcast from the Paul Nipkow TV station in Berlin. In 1936, under the guidance of "Minister of Public Enlightenment and Propaganda" Joseph Goebbels, direct transmissions from fifteen mobile units at the Olympic Games in Berlin were transmitted to selected small television houses (Fernsehstuben) in Berlin and Hamburg. In 1941, the first NTSC meetings produced a single standard for US broadcasts. US television broadcasts began in earnest in the immediate post-war era, and by 1950 there were 6 million televisions in the United States. The basic idea of using three monochrome images to produce a color image had been experimented with almost as soon as black-and-white televisions had first been built. Among the earliest published proposals for television was one by Maurice Le Blanc in 1880 for a color system, including the first mentions in television literature of line and frame scanning, although he gave no practical details. Polish inventor Jan Szczepanik patented a color television system in 1897, using a selenium photoelectric cell at the transmitter and an electromagnet controlling an oscillating mirror and a moving prism at the receiver. But his system contained no means of analyzing the spectrum of colors at the transmitting end, and could not have worked as he described it. An Armenian inventor, Hovannes Adamian, also experimented with color television as early as 1907. The first color television project is claimed by him, and was patented in Germany on March 31, 1908, patent number 197183, then in Britain, on April 1, 1908, patent number 7219, in France (patent number 390326) and in Russia in 1910 (patent number 17912). Scottish inventor John Logie Baird demonstrated the world's first color transmission on July 3, 1928, using scanning discs at the transmitting and receiving ends with three spirals of apertures, each spiral with filters of a different primary color; and three light sources, controlled by the signal, at the receiving end, with a commutator to alternate their illumination. The demonstration was of a young girl wearing different colored hats. The girl, Noele Gordon, later became a TV actress in the soap opera Crossroads. Baird also made the world's first color broadcast on February 4, 1938, sending a mechanically scanned 120-line image from Baird's Crystal Palace studios to a projection screen at London's Dominion Theatre. Mechanically scanned color television was also demonstrated by Bell Laboratories in June 1929 using three complete systems of photoelectric cells, amplifiers, glow-tubes, and color filters, with a series of mirrors to superimpose the red, green, and blue images into one full color image. As was the case with black-and-white television, an electronic means of scanning would be superior to the mechanical systems like Baird's. The obvious solution on the broadcast end would be to use three conventional Iconoscopes with colored filters in front of them to produce an RGB signal. Using three separate tubes each looking at the same scene would produce slight differences in parallax between the frames, so in practice a single lens was used with a mirror or prism system to separate the colors for the separate tubes. Each tube captured a complete frame and the signal was converted into radio in a fashion essentially identical to the existing black-and-white systems. The problem with this approach was there was no simple way to recombine them on the receiver end. If each image was sent at the same time on different frequencies, the images would have to be "stacked" somehow on the display, in real time. The simplest way to do this would be to reverse the system used in the camera: arrange three separate black-and-white displays behind colored filters and then optically combine their images using mirrors or prisms onto a suitable screen, like frosted glass. RCA built just such a system in order to present the first electronically scanned color television demonstration on February 5, 1940, privately shown to members of the US Federal Communications Commission at the RCA plant in Camden, New Jersey. This system, however, suffered from the twin problems of costing at least three times as much as a conventional black-and-white set, as well as having very dim pictures, the result of the fairly low illumination given off by tubes of the era. Projection systems of this sort would become common decades later, however, with improvements in technology. Another solution would be to use a single screen, but break it up into a pattern of closely spaced colored phosphors instead of an even coating of white. Three receivers would be used, each sending its output to a separate electron gun, aimed at its colored phosphor. Although obvious, this solution was not practical. The electron guns used in monochrome televisions had limited resolution, and if one wanted to retain the resolution of existing monochrome displays, the guns would have to focus on individual dots three times smaller. This was beyond the state of the art. Instead, a number of hybrid solutions were developed that combined a conventional monochrome display with a colored disk or mirror. In these systems the three colored images were sent one after each other, in either complete frames in the "field-sequential color system", or for each line in the "line-sequential" system. In both cases a colored filter was rotated in front of the display in sync with the broadcast. Since three separate images were being sent in sequence, if they used existing monochrome radio signaling standards they would have an effective refresh rate of only 20 fields, or 10 frames, a second, well into the region where flicker would become visible. In order to avoid this, these systems increased the frame rate considerably, making the signal incompatible with existing monochrome standards. The first practical example of this sort of system was again pioneered by John Logie Baird. In 1940 he publicly demonstrated a color television combining a traditional black-and-white display with a rotating colored disk. This device was very "deep", but was later improved with a mirror folding the light path into an entirely practical device resembling a large conventional console. However, Baird was not happy with the design, and as early as 1944 had commented to a British government committee that a fully electronic device would be better. In 1939, Hungarian engineer Peter Carl Goldmark introduced an electro-mechanical system while at CBS, which contained an Iconoscope sensor. The CBS field-sequential color system was partly mechanical, with a disc made of red, blue, and green filters spinning inside the television camera at 1,200 rpm, and a similar disc spinning in synchronization in front of the cathode ray tube inside the receiver set. The system was first demonstrated to the Federal Communications Commission (FCC) on August 29, 1940, and shown to the press on September 4. CBS began experimental color field tests using film as early as August 28, 1940, and live cameras by November 12. NBC (owned by RCA) made its first field test of color television on February 20, 1941. CBS began daily color field tests on June 1, 1941. These color systems were not compatible with existing black-and-white television sets, and as no color television sets were available to the public at this time, viewing of the color field tests was restricted to RCA and CBS engineers and the invited press. The War Production Board halted the manufacture of television and radio equipment for civilian use from April 22, 1942 to August 20, 1945, limiting any opportunity to introduce color television to the general public. As early as 1940, Baird had started work on a fully electronic system he called the "Telechrome". Early Telechrome devices used two electron guns aimed at either side of a phosphor plate. The phosphor was patterned so the electrons from the guns only fell on one side of the patterning or the other. Using cyan and magenta phosphors, a reasonable limited-color image could be obtained. He also demonstrated the same system using monochrome signals to produce a 3D image (called "stereoscopic" at the time). Baird's demonstration on August 16, 1944 was the first example of a practical color television system. Work on the Telechrome continued and plans were made to introduce a three-gun version for full color. However, Baird's untimely death in 1946 ended development of the Telechrome system. Similar concepts were common through the 1940s and 50s, differing primarily in the way they re-combined the colors generated by the three guns. The Geer tube was similar to Baird's concept, but used small pyramids with the phosphors deposited on their outside faces, instead of Baird's 3D patterning on a flat surface. The Penetron used three layers of phosphor on top of each other and increased the power of the beam to reach the upper layers when drawing those colors. The Chromatron used a set of focusing wires to select the colored phosphors arranged in vertical stripes on the tube. In the immediate post-war era the Federal Communications Commission (FCC) was inundated with requests to set up new television stations. Worrying about congestion of the limited number of channels available, the FCC put a moratorium on all new licenses in 1948 while considering the problem. A solution was immediately forthcoming; rapid development of radio receiver electronics during the war had opened a wide band of higher frequencies to practical use, and the FCC set aside a large section of these new UHF bands for television broadcast. At the time, black and white television broadcasting was still in its infancy in the U.S., and the FCC started to look at ways of using this newly available bandwidth for color broadcasts. Since no existing television would be able to tune in these stations, they were free to pick an incompatible system and allow the older VHF channels to die off over time. The FCC called for technical demonstrations of color systems in 1948, and the Joint Technical Advisory Committee (JTAC) was formed to study them. CBS displayed improved versions of its original design, now using a single 6 MHz channel (like the existing black-and-white signals) at 144 fields per second and 405 lines of resolution. Color Television Inc. demonstrated its line-sequential system, while Philco demonstrated a dot-sequential system based on its beam-index tube-based "Apple" tube technology. Of the entrants, the CBS system was by far the best-developed, and won head-to-head testing every time. While the meetings were taking place it was widely known within the industry that RCA was working on a dot-sequential system that was compatible with existing black-and-white broadcasts, but RCA declined to demonstrate it during the first series of meetings. Just before the JTAC presented its findings, on August 25, 1949, RCA broke its silence and introduced its system as well. The JTAC still recommended the CBS system, and after the resolution of an ensuing RCA lawsuit, color broadcasts using the CBS system started on June 25, 1951. By this point the market had changed dramatically; when color was first being considered in 1948 there were fewer than a million television sets in the U.S., but by 1951 there were well over 10 million. The idea that the VHF band could be allowed to "die" was no longer practical. During its campaign for FCC approval, CBS gave the first demonstrations of color television to the general public, showing an hour of color programs daily Mondays through Saturdays, beginning January 12, 1950, and running for the remainder of the month, over WOIC in Washington, D.C., where the programs could be viewed on eight 16-inch color receivers in a public building. Due to high public demand, the broadcasts were resumed February 13–21, with several evening programs added. CBS initiated a limited schedule of color broadcasts from its New York station WCBS-TV Mondays to Saturdays beginning November 14, 1950, making ten color receivers available for the viewing public. All were broadcast using the single color camera that CBS owned. The New York broadcasts were extended by coaxial cable to Philadelphia's WCAU-TV beginning December 13, and to Chicago on January 10, making them the first network color broadcasts. After a series of hearings beginning in September 1949, the FCC found the RCA and CTI systems fraught with technical problems, inaccurate color reproduction, and expensive equipment, and so formally approved the CBS system as the U.S. color broadcasting standard on October 11, 1950. An unsuccessful lawsuit by RCA delayed the first commercial network broadcast in color until June 25, 1951, when a musical variety special titled simply Premiere was shown over a network of five East Coast CBS affiliates. Viewing was again restricted: the program could not be seen on black-and-white sets, and Variety estimated that only thirty prototype color receivers were available in the New York area. Regular color broadcasts began that same week with the daytime series The World Is Yours and Modern Homemakers. While the CBS color broadcasting schedule gradually expanded to twelve hours per week (but never into prime time), and the color network expanded to eleven affiliates as far west as Chicago, its commercial success was doomed by the lack of color receivers necessary to watch the programs, the refusal of television manufacturers to create adapter mechanisms for their existing black-and-white sets, and the unwillingness of advertisers to sponsor broadcasts seen by almost no one. CBS had bought a television manufacturer in April, and in September 1951, production began on the only CBS-Columbia color television model, with the first color sets reaching retail stores on September 28. But it was too little, too late. Only 200 sets had been shipped, and only 100 sold, when CBS discontinued its color television system on October 20, 1951, ostensibly by request of the National Production Authority for the duration of the Korean War, and bought back all the CBS color sets it could to prevent lawsuits by disappointed customers. RCA chairman David Sarnoff later charged that the NPA's order had come "out of a situation artificially created by one company to solve its own perplexing problems" because CBS had been unsuccessful in its color venture. While the FCC was holding its JTAC meetings, development was taking place on a number of systems allowing true simultaneous color broadcasts, "dot-sequential color systems". Unlike the hybrid systems, dot-sequential televisions used a signal very similar to existing black-and-white broadcasts, with the intensity of every dot on the screen being sent in succession. In 1938 Georges Valensi demonstrated an encoding scheme that would allow color broadcasts to be encoded so they could be picked up on existing black-and-white sets as well. In his system the output of the three camera tubes were re-combined to produce a single "luminance" value that was very similar to a monochrome signal and could be broadcast on the existing VHF frequencies. The color information was encoded in a separate "chrominance" signal, consisting of two separate signals, the original blue signal minus the luminance (B'–Y'), and red-luma (R'–Y'). These signals could then be broadcast separately on a different frequency; a monochrome set would tune in only the luminance signal on the VHF band, while color televisions would tune in both the luminance and chrominance on two different frequencies, and apply the reverse transforms to retrieve the original RGB signal. The downside to this approach is that it required a major boost in bandwidth use, something the FCC was interested in avoiding. RCA used Valensi's concept as the basis of all of its developments, believing it to be the only proper solution to the broadcast problem. However, RCA's early sets using mirrors and other projection systems all suffered from image and color quality problems, and were easily bested by CBS's hybrid system. But solutions to these problems were in the pipeline, and RCA in particular was investing massive sums (later estimated at $100 million) to develop a usable dot-sequential tube. RCA was beaten to the punch by the Geer tube, which used three B&W tubes aimed at different faces of colored pyramids to produce a color image. All-electronic systems included the Chromatron, Penetron and beam-index tube that were being developed by various companies. While investigating all of these, RCA's teams quickly started focusing on the shadow mask system. In July 1938 the shadow mask color television was patented by Werner Flechsig (1900–1981) in Germany, and was demonstrated at the International radio exhibition Berlin in 1939. Most CRT color televisions used today are based on this technology. His solution to the problem of focusing the electron guns on the tiny colored dots was one of brute-force; a metal sheet with holes punched in it allowed the beams to reach the screen only when they were properly aligned over the dots. Three separate guns were aimed at the holes from slightly different angles, and when their beams passed through the holes the angles caused them to separate again and hit the individual spots a short distance away on the back of the screen. The downside to this approach was that the mask cut off the vast majority of the beam energy, allowing it to hit the screen only 15% of the time, requiring a massive increase in beam power to produce acceptable image brightness. In spite of these problems in both the broadcast and display systems, RCA pressed ahead with development and was ready for a second assault on the standards by 1950. The possibility of a compatible color broadcast system was so compelling that the NTSC decided to re-form, and held a second series of meetings starting in January 1950. Having only recently selected the CBS system, the FCC heavily opposed the NTSC's efforts. One of the FCC Commissioners, R. F. Jones, went so far as to assert that the engineers testifying in favor of a compatible system were "in a conspiracy against the public interest". Unlike the FCC approach where a standard was simply selected from the existing candidates, the NTSC would produce a board that was considerably more pro-active in development. Colour broadcasts from the United States were available to Canadian population centers near the border since the mid-1950s. At the time that NTSC colour broadcasting was officially introduced into Canada in 1966, less than one percent of Canadian households had a colour television set. Colour television in Canada was launched on the Canadian Broadcasting Corporation's (CBC) English language TV service on September 1, 1966. Private television broadcaster CTV also started colour broadcasts in early September 1966. The CBC's French-language TV service, Radio-Canada, was broadcasting colour programming for 15 hours a week in 1968. Full-time colour transmissions started in 1974 on the CBC, with other private sector broadcasters in the country doing so by the end of the 1970s. Cuba in 1958 became the second country in the world to introduce color television broadcasting, with Havana's Channel 12 using standards established by the NTSC Committee of United States Federal Communications Commission in 1940, and American technology patented by the American electronics company RCA, or Radio Corporation of America. But the color transmissions ended when broadcasting stations were seized in the Cuban Revolution in 1959, and did not return until 1975, using equipment acquired from Japan's NEC Corporation, and SECAM equipment from the Soviet Union, adapted for the American NTSC standard. Guillermo González Camarena independently invented and developed a field-sequential tricolor disk system in México in the late 1930s, for which he requested a patent in México on August 19 of 1940 and in the USA in 1941. González Camarena produced his color television system in his laboratory Gon-Cam for the Mexican market and exported it to the Columbia College of Chicago, who regarded it as the best system in the world. Goldmark actually applied patent for the same field-sequential tricolor system in USA on September 7 of 1940; while González Camarena made his application in México nineteen days before, on August 19 of 1940. On August 31, 1946 González Camarena sent his first color transmission from his lab in the offices of The Mexican League of Radio Experiments at Lucerna St. No. 1, in Mexico City. The video signal was transmitted at a frequency of 115 MHz. and the audio in the 40 metre band. He obtained authorization to make the first publicly announced color broadcast in Mexico, on February 8, 1963, of the program Paraíso Infantil on Mexico City's XHGC-TV, using the NTSC system which had by now been adopted as the standard for color programming. González Camarena also invented the Simplified Mexican Color TV system as a much simpler and cheaper alternative to the NTSC system. Due to its simplicity, NASA used a modified version of the Simplified Mexican Color TV system in his Voyager mission of 1979, to take pictures and video of Jupiter. Although all-electronic color was introduced in the U.S. in 1953, high prices and the scarcity of color programming greatly slowed its acceptance in the marketplace. The first national color broadcast (the 1954 Tournament of Roses Parade) occurred on January 1, 1954, but over the next dozen years most network broadcasts, and nearly all local programming, continued to be in black-and-white. In 1956 NBC's The Perry Como Show became the first live network television series to present a majority of episodes in color. CBS's The Big Record, starring pop vocalist Patti Page, was the first television show broadcast in color for the entire 1957-1958 season; its production costs were greater than most movies were at the time not only because of all the stars featured on the hour-long extravaganza but the extremely high-intensity lighting and electronics required for the new RCA TK-41 cameras. It was not until the mid-1960s that color sets started selling in large numbers, due in part to the color transition of 1965 in which it was announced that over half of all network prime-time programming would be broadcast in color that autumn. The first all-color prime-time season came just one year later. NBC made the first coast-to-coast color broadcast when it telecast the Tournament of Roses Parade on January 1, 1954, with public demonstrations given across the United States on prototype color receivers by manufacturers RCA, General Electric, Philco, Raytheon, Hallicrafters, Hoffman, Pacific Mercury, and others. A color model from Admiral C1617A became available in the Chicago area on January 4, 1954 and appeared in various stores throughout the country, Maryland January 6, 1954, San Francisco, January 14, 1954, Indianapolis, January 17, 1954, Pittsburgh, January 25, 1954 and Oakland, January 26, 1954 among other cities thereafter. A color model from Westinghouse H840CK15 ($1,295, or equivalent to $12,082 in 2018) became available in the New York area on February 28, 1954 ; a less expensive color model from RCA (CT-100) reached dealers in April 1954. Television's first prime time network color series was The Marriage, a situation comedy broadcast live by NBC in the summer of 1954. NBC's anthology series Ford Theatre became the first network color filmed series that October. Early color telecasts could be preserved only on the black-and-white kinescope process introduced in 1947. It was not until September 1956 that NBC began using color film to time-delay and preserve some of its live color telecasts. Ampex introduced a color videotape recorder in 1958, which NBC used to tape An Evening With Fred Astaire, the oldest surviving network color videotape. This system was also used to unveil a demonstration of color television for the press. On May 22, 1958, President Dwight D. Eisenhower visited the WRC-TV NBC studios in Washington, D.C. and gave a speech touting the new technology's merits. His speech was recorded in color, and a copy of this videotape was given to the Library of Congress for posterity. Several syndicated shows had episodes filmed in color during the 1950s, including The Cisco Kid, The Lone Ranger, My Friend Flicka, and Adventures of Superman. The first two were carried by some stations equipped for color telecasts well before NBC began its regular weekly color dramas in 1959, beginning with the Western series Bonanza. NBC was at the forefront of color programming because its parent company RCA manufactured the most successful line of color sets in the 1950s, and by 1959 RCA was the only remaining major manufacturer of color sets. CBS and ABC, which were not affiliated with set manufacturers and were not eager to promote their competitor's product, dragged their feet into color. CBS broadcast color specials and sometimes aired its big weekly variety shows in color, but it offered no regularly scheduled color programming until the fall of 1965. At least one CBS show, The Lucy Show, was filmed in color beginning in 1963 but continued to be telecast in black and white through the end of the 1964–65 season. ABC delayed its first color programs until 1962, but these were initially only broadcasts of the cartoon shows The Flintstones, The Jetsons and Beany and Cecil. The DuMont network, although it did have a television-manufacturing parent company, was in financial decline by 1954 and was dissolved two years later. The relatively small amount of network color programming, combined with the high cost of color television sets, meant that as late as 1964 only 3.1 percent of television households in the U.S. had a color set. But by the mid-1960s, the subject of color programming turned into a ratings war. A 1965 ARB study that proposed an emerging trend in color television set sales convinced NBC that a full shift to color would gain a ratings advantage over its two competitors. As a result, NBC provided the catalyst for rapid color expansion by announcing that its prime time schedule for fall 1965 would be almost entirely in color. ABC and CBS followed suit and over half of their combined prime-time programming also was in color that season, but they were still reluctant to telecast all their programming in color due to production costs. All three broadcast networks were airing full color prime time schedules by the 1966–67 broadcast season, and ABC aired its last new black-and-white daytime programming in December 1967. Public broadcasting networks like NET, however, did not use color for a majority of their programming until 1968. The number of color television sets sold in the U.S. did not exceed black-and-white sales until 1972, which was also the first year that more than fifty percent of television households in the U.S. had a color set. This was also the year that "in color" notices before color television programs ended, due to the rise in color television set sales, and color programming having become the norm. In a display of foresight, Disney had filmed many of its earlier shows in color so they were able to be repeated on NBC, and since most of Disney's feature-length films were also made in color, they could now also be telecast in that format. To emphasize the new feature, the series was re-dubbed Walt Disney's Wonderful World of Color, which premiered in September 1961, and retained that moniker until 1969. By the mid-1970s the only stations broadcasting in black-and-white were a few high-numbered UHF stations in small markets, and a handful of low-power repeater stations in even smaller markets such as vacation spots. By 1979, even the last of these had converted to color and by the early 1980s, B&W sets had been pushed into niche markets, notably low-power uses, small portable sets, or use as video monitor screens in lower-cost consumer equipment. By the late 1980s, even those areas switched to color sets. Color broadcasting in Hawaii started in September 1965, and in Alaska a year later. One of the last television stations in North America to convert to color, WQEX (now WINP-TV) in Pittsburgh, started broadcasting in color on October 16, 1986 after its black-and-white transmitter, which dated from the 1950s, broke down in February 1985 and the parts required to fix it were no longer available. The then-owner of WQEX, PBS member station WQED, used some of its pledge money to buy a color transmitter. Early color sets were either floor-standing console models or tabletop versions nearly as bulky and heavy, so in practice, they remained firmly anchored in one place. The introduction of GE's relatively compact and lightweight Porta-Color set in the spring of 1966 made watching color television a more flexible and convenient proposition. In 1972, sales of color sets finally surpassed sales of black-and-white sets. Also in 1972, the last holdout among daytime network programs converted to color, resulting in the first completely all-color network season. The first regular colour broadcasts in Europe were by the UK's BBC2 beginning on July 1, 1967 (using the PAL system). West Germany's first colour broadcast occurred in August (PAL), followed by the Netherlands in September (PAL), and by France in October (SECAM). Denmark, Norway, Sweden, Finland, Austria, East Germany, Czechoslovakia, and Hungary all started regular colour broadcasts around 1969/1970. Ireland's national TV station RTÉ began using colour in 1968 for recorded programmes; the first outside broadcast made in colour for RTÉ Television was when Ireland hosted the Eurovision Song Contest in Dublin in 1971. The PAL system spread through most of Western Europe. More European countries introduced colour television using the PAL system in the 1970s and early 1980s; examples include Belgium (1971), Yugoslavia (1971), Spain (1972, but not fully implemented until 1977), Iceland (1973), Portugal (1975, but not fully implemented until 1980), Albania (1981), Turkey (1981) and Romania (1983, but not fully implemented until 1991). In Italy there were debates to adopt a national colour television system, the ISA, developed by Indesit, but that idea was scrapped. As a result, Italy was one of the last European countries to officially adopt the PAL system in the 1976-1977 season. France, Luxembourg, and most of the Eastern Bloc along with their overseas territories opted for SECAM. SECAM was a popular choice in countries with much hilly terrain, and countries with a very large installed base of older monochrome equipment, which could cope much better with the greater ruggedness of the SECAM signal. However, for many countries the decision was more down to politics than technical merit. A drawback of SECAM for production is that, unlike PAL or NTSC, certain post-production operations of encoded SECAM signals are not really possible without a significant drop in quality. As an example, a simple fade to black is trivial in NTSC and PAL: one merely reduces the signal level until it is zero. However, in SECAM the colour difference signals, which are frequency modulated, need first to be decoded to e.g. RGB, then the fade-to-black is applied, and finally the resulting signal is re-encoded into SECAM. Because of this, much SECAM video editing was actually done using PAL equipment, then the resultant signal was converted to SECAM. Another drawback of SECAM is that comb filtering, allowing better colour separation, is not possible in TV receivers. This was not, however, much of a drawback in the early days of SECAM as such filters were not readily available in high-end TV sets before the 1990s. The first regular colour broadcasts in SECAM were started on October 1, 1967, on France's Second Channel (ORTF 2e chaîne). In France and the UK colour broadcasts were made on UHF frequencies, the VHF band being used for black and white, 405 lines in UK or 819 lines in France, until the beginning of the 1980s. Countries elsewhere that were already broadcasting 625-line monochrome on VHF and UHF, simply transmitted colour programs on the same channels. Some British television programs, particularly those made by or for ITC Entertainment, were shot on colour film before the introduction of colour television to the UK, for the purpose of sales to U.S. networks. The first British show to be made in colour was the drama series The Adventures of Sir Lancelot (1956–57), which was initially made in black and white but later shot in colour for sale to the NBC network in the United States. Other British colour television programs include Stingray (1964–1965), which was the first British TV show to be filmed entirely in colour, Thunderbirds (1965–1966) and Captain Scarlet and the Mysterons (1967–1968). However, most UK series predominantly made using videotape, such as Doctor Who (1963–89; 2005–present) did not begin colour production until later, with the first colour Doctor Who episodes not airing until 1970 . In Japan, NHK and NTV introduced colour television, using a variation of the NTSC system (called NTSC-J) on September 10, 1960, making it the first country in Asia to introduce colour television. The Philippines (1966) and Taiwan (1969) also adopted the NTSC system. Other countries in the region instead used the PAL system, starting with Australia (1967, originally scheduled for 1972, but not fully implemented until 1975), and then Thailand (1969; this country converted from a 525-line system to 625 lines), Hong Kong (1970), the People's Republic of China (1971), New Zealand (1973), North Korea (1974), Singapore (1974), Pakistan (1976, but not fully implemented until 1982), Kazakhstan (1978), Vietnam (1978), Malaysia (1978, but not fully implemented until 1980), Indonesia (1979), India (1979, but not fully implemented until 1982), and Bangladesh (1980). South Korea did not introduce colour television (using NTSC) until 1980 (with full-time colour transmissions starting from 1981), although it was already manufacturing color television sets for export. Cambodia was the last country in Asia to introduce colour television, officially introduced in 1981 using the PAL system, with full-time colour transmissions since 1985. Nearly all of the countries in the Middle East use PAL. The first country in the Middle East to introduce color television was Iraq in 1967. Saudi Arabia, the United Arab Emirates, Kuwait, Bahrain, and Qatar followed in the mid-1970s, but Israel, Lebanon, and Cyprus continued to broadcast in black and white until the early 1980s. Israeli television even erased the color signals using a device called the mekhikon. The first color television service in Africa was introduced on the Tanzanian island of Zanzibar, in 1973, using PAL. In 1973 also, MBC of Mauritius broadcast the OCAMM Conference, in color, using SECAM. At the time, South Africa did not have a television service at all, owing to opposition from the apartheid regime, but in 1976, one was finally launched. Nigeria adopted PAL for color transmissions in 1974 in the then Benue Plateau state in the north central region of the country, but countries such as Ghana and Zimbabwe continued with black and white until 1984. The Sierra Leone Broadcasting Service (SLBS) started television broadcasting in 1963 as a cooperation between the SLBS and commercial interests; coverage was extended to all districts in 1978 when the service was also upgraded to color. Unlike most other countries in the Americas, which had adopted NTSC, Brazil began broadcasting in color using PAL-M, on February 19, 1972. Ecuador was the first South American country to broadcast in color using NTSC, on November 5, 1974. In 1978, Argentina started broadcasting in color using PAL-N in connection with the country's hosting of the FIFA World Cup. Some countries in South America, including Bolivia, Paraguay, Peru, and Uruguay, broadcast only in black and white until the early 1980s. Cor Dillen, director and later CEO of the South American branch of Philips, was responsible for bringing color television to South America. There are three main analog broadcast television systems in use around the world, PAL (Phase Alternating Line), NTSC (National Television System Committee), and SECAM (Séquentiel Couleur à Mémoire—Sequential Color with Memory). The system used in The Americas and part of the Far East is NTSC. Most of Asia, Western Europe, Australia, Africa, and Eastern South America use PAL (though Brazil uses a hybrid PAL-M system). Eastern Europe and France uses SECAM. Generally, a device (such as a television) can only read or display video encoded to a standard which the device is designed to support; otherwise, the source must be converted (such as when European programs are broadcast in North America or vice versa). Digital television broadcasting standards, such as ATSC, DVB-T, DVB-T2, and ISDB, have superseded these analog transmission standards in many countries. ^ "BBC - History - John Logie Baird". Retrieved June 25, 2018. ^ Kamm, Antony; Baird, John. John Logie Baird: A Life. p. 69. ^ M. Le Blanc, "Etude sur la transmission électrique des impressions lumineuses", La Lumière Electrique, vol. 11, December 1, 1880, p. 477–481. ^ Baird Television: Crystal Palace Television Studios Archived February 5, 2015, at the Wayback Machine. Previous color television demonstrations in the U.K. and U.S. had been via closed circuit. ^ Kenyon Kilbon, Pioneering in Electronics: A Short History of the Origins and Growth of RCA Laboratories, Radio Corporation of America, 1919 to 1964, Chapter Nine – Television: Monochrome to Color Archived April 30, 2008, at the Wayback Machine, 1964. V.K. Zworykin with Frederick Olessi, Iconoscope: An Autobiography of Vladimir Zworykin, Chapter 10 – Television Becomes a Reality, 1945–1954 Archived April 19, 2008, at the Wayback Machine, 1971. "The system used two color filters in combination with photocells and a flying spot scanner for pickup." Alfred V. Roman, The Historical Development of Color Television Systems, doctoral dissertation, New York University, 1967, p. 49. ^ "The World's First High Definition Colour Television System". www.bairdtelevision.com. Archived from the original on April 3, 2015. ^ a b Peter C. Goldmark, assignor to Columbia Broadcasting System, "Color Television", U.S. Patent 2,480,571, filed September 7, 1940. ^ "Color Television Success in Test", The New York Times, August 30, 1940, p. 21. ^ "Color Television Achieves Realism", The New York Times, September 5, 1940, p. 18. ^ "Color Television Success in Test," New York Times, August 30, 1940, p. 21. "CBS Demonstrates Full Color Television," Wall Street Journal, September 5, 1940, p. 1. "Television Hearing Set," New York Times, November 13, 1940, p. 26. ^ Ed Reitan, RCA-NBC Color Firsts in Television (commented) Archived December 25, 2014, at Wikiwix. ^ "Making of Radios and Phonographs to End April 22," New York Times, March 8, 1942, p. 1. "Radio Production Curbs Cover All Combinations," Wall Street Journal, June 3, 1942, p. 4. "WPB Cancels 210 Controls; Radios, Trucks in Full Output," New York Times, August 21, 1945, p. 1. ^ Bob Cooper, "Television: The Technology That Changed Our Lives Archived December 23, 2014, at the Wayback Machine", Early Television Foundation. ^ Hempstead, Colin (2005). Encyclopedia of 20th-Century Technology. Routledge. p. 824. ^ Baird Television: The World's First High Definition Colour Television System Archived April 3, 2015, at the Wayback Machine. ^ "Color TV Tests To Be Resumed In Washington", The Washington Post, February 12, 1950, p. M5. 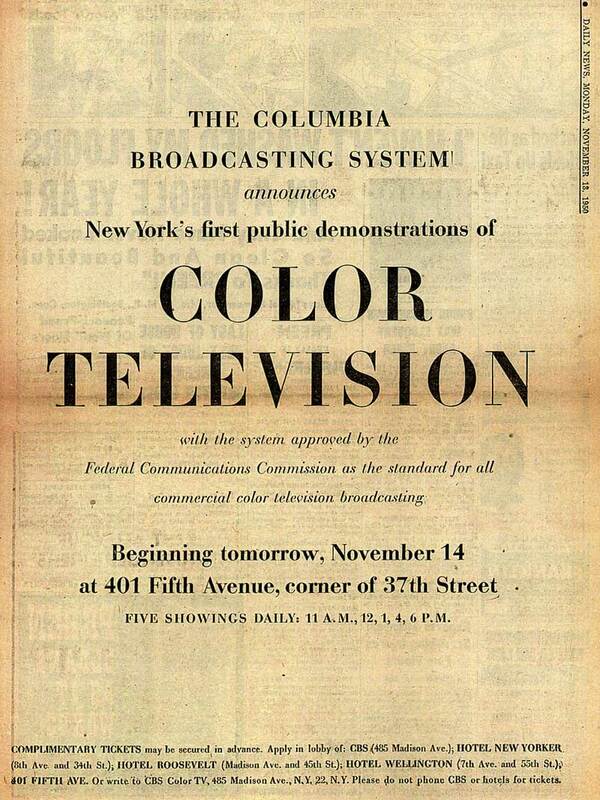 ^ "CBS Color Television To Make Public Debut In N.Y. Next Week", The Wall Street Journal, November 9, 1950, p. 18. ^ CBS Announces Color Television Archived August 4, 2008, at the Wayback Machine (advertisement), New York Daily News, November 13, 1950, p. .
^ "You Can See The Blood on Color Video," The Washington Post, January 15, 1950, p. L1. "Video Color Test Begins on C.B.S.," New York Times, November 14, 1950, p. 44. ^ "CBS Color Preview Seen By 2,000 in Philadelphia", The Wall Street Journal, December 16, 1950, p. 10. ^ "CBS to Display Color Video in City Next Week", Chicago Tribune, January 6, 1951, television and radio section, p. C4. ^ "Preview of CBS Color TV Wins City's Acclaim", Chicago Tribune, January 10, 1951, p. A8. ^ "C.B.S. Color Video Presents a 'First'," New York Times, June 26, 1951, p. 31. ^ Four-hundred guests watched the premiere commercial broadcast on eight color receivers at a CBS studio in New York, as no color receivers were available to the general public. "C.B.S. Color Video Presents a 'First"", New York Times, June 26, 1951, p. 31. A total of about 40 color receivers was available in the five cities on the color network. The CBS affiliate in Washington had three receivers and a monitor. "First Sponsored TV in Color Praised by WTOP Audience", The Washington Post, June 26, 1951, p. 1. Most of the remainder of the prototype color receivers were given to advertisers sponsoring the color broadcasts. "Today, June 25, 1951, is a turning point in broadcasting history" (WTOP-TV advertisement), The Washington Post, June 25, 1951, p. 10. ^ Ed Reitan, "Progress of CBS Colorcasting", Programming for the CBS Color System. ^ "CBS Color System Network Affiliates", Programming for the CBS Color System. ^ "CBS Color System Makes Television Set Makers See Red", Wall Street Journal, October 17, 1950, p. 1. Three exceptions among the major television manufacturers were Philco, which offered 11 models that could show CBS color broadcasts in black-and-white; and Westinghouse and Admiral, which offered adapters to receive color broadcasts in black and white. "Philco Offers 11 TV Sets To Receive CBS Color TV in Black and White", Wall Street Journal, June 4, 1951, p. 9. "Westinghouse to Sell Adapter for CBS Color TV Signals", Wall Street Journal, August 7, 1951, p. 18. ^ "Hytron's Deal With CBS Seen TV Color Aid", The Washington Post, April 12, 1951, p. 15. ^ "CBS Subsidiary Starts Mass Production of Color Television Sets," Wall Street Journal, September 13, 1951, p. 18. ^ "Para-TV Color Sets To Go On Sale Soon", Billboard, October 6, 1951, p. 6. ^ "RCA to Test Color TV System On Three Shows Daily Beginning Today", The Wall Street Journal, July 9, 1951, p. 3. ^ "CBS Says Confusion Now Bars Color TV," Washington Post, March 26, 1953, p. 39. ^ "N.P.A. Decides to End Restrictions on Output Of Color TV Sets", The Wall Street Journal, March 21, 1953, p. 1. ^ "F.C.C. Rules Color TV Can Go on Air at Once," New York Times, December 19, 1953, p. 1. ^ a b c d CBC Staff (September 5, 1991). "CBC in Living Colour". CBC News. Ottawa. Archived from the original on January 1, 2014. Retrieved 2014-01-01. ^ "Color It Expensive". The Calgary Herald. Calgary, Alberta. September 1, 1966. p. 4. Retrieved April 14, 2012. ^ "SRC Radio-Canada Network - History of Canadian Broadcasting". www.broadcasting-history.ca. Archived from the original on December 26, 2017. ^ Roberto Diaz-Martin, "The Recent History of Satellite Communications in Cuba", Selection of a Color Standard Archived December 25, 2017, at the Wayback Machine, in Beyond the Ionosphere: Fifty Years of Satellite Communication (NASA SP-4217, 1997). ^ Leslie Solomon (July 1964). "Simplified Mexican Color TV" (PDF). Electronics World. 72 (1): 48 and 71. ^ Butler, Jeremy G. (2006). Television: Critical Methods and Applications. Psychology Press. p. 290. ISBN 9781410614742. ^ Gould, Jack (January 1, 1954). "Television in Review / Intra-Industry Row Over TV Color Credits Beginning to Assume Silly Proportions". The New York Times. Retrieved February 18, 2019. ^ "Television in Review: N.B.C. Color," New York Times, January 5, 1954, p. 28. Two days earlier Admiral demonstrated to their distributors the prototype of Admiral's first color television set planned for consumer sale using the NTSC standards, priced at $1,175 (equivalent to $10,962 in 2018). It is not known when the later commercial version of this receiver was first sold. Production was extremely limited, and no advertisements for it were published in New York or Washington newspapers. "First Admiral Color TV," New York Times, December 31, 1953, p. 22. "Admiral's First Color TV Set," Wall Street Journal, December 31, 1953, p. 5. "TV Firm Moves to Golden Triangle", The Pittsburgh Press, February 23, 1954, p. 9. ^ Westinghouse display ad, New York Times, February 28, 1954, p. 57. Only 30 sets were sold in its first month. "Color TV Reduced by Westinghouse," April 2, 1954, p. 36. ^ RCA's manufacture of color sets started March 25, 1954, and 5,000 Model CT-100's were produced. Initially $1,000, its price was cut to $495 in August 1954 ($4.62 thousand in today's dollars). "R.C.A. Halves Cost of Color TV Sets," New York Times, August 10, 1954, p. 21. ^ "News of TV and Radio," New York Times, June 20, 1954, p. X11. ^ After 15 episodes in color, Ford reduced costs by making only every third episode in color. "Ford Cuts Back on Color Film", Billboard, October 30, 1954, p. 6. The syndicated Cisco Kid had been filmed in color since 1949 in anticipation of color broadcasting. "'Cisco Kid' for TV Via Pact With Ziv", Billboard, September 24, 1949, p. 47. "Ziv to Shoot All New Series in B & W and Color Versions", Billboard, April 4, 1953, p. 10. ^ Albert Abramson, The History of Television, 1942 to 2000, McFarland, 2003, p. 74. ISBN 978-0-7864-1220-4. ^ RCA made about 95 percent of the color television sets sold in the U.S. in 1960. Peter Bart, "Advertising: Color TV Set Output Spurred," New York Times, July 31, 1961, p. 27. ^ "ABC to Go Tint at First Sponsor Nibble", Billboard, September 4, 1954, p. 8. ^ "Chasing the Rainbow Archived July 24, 2008, at the Wayback Machine," Time, June 30, 1958. ^ The Flintstones, The Jetsons, and Beany and Cecil. "A.B.C.-TV To Start Color Programs," New York Times, April 1, 1962, p. 84. "More Color," New York Times, September 23, 1962, p. 145. Ed Reitan, RCA-NBC Firsts in Television Archived December 19, 2008, at the Wayback Machine. Jack Gould, "Tinted TV Shows Its Colors," New York Times, November 29, 1964, p. X17. ^ Clarke Ingram, The DuMont Television Network, Chapter Seven: Finale Archived August 4, 2009, at the Wayback Machine. The small amount of color programming that DuMont broadcast in 1954–1955 (mostly its show Sunday Supplement) was all from color films. ^ a b "Color Revolution: Television In The Sixties - TVObscurities". tvobscurities.com. Archived from the original on January 3, 2015. ^ The exceptions being I Dream of Jeannie and Convoy. ^ The game show Everybody's Talking. CBS's daytime soap opera The Secret Storm was the last network show to switch to color after airing its last black-and-white performance on March 11, 1968, making it the last black-and-white series on commercial network television. The last black-and-white series on network television was MisteRogers' Neighborhood on the non-commercial NET. Production of this series switched over to color in August 1968. ^ Television Facts and Statistics – 1939 to 2000 Archived July 31, 2008, at the Wayback Machine, Television History – The First 75 Years. ^ "THE ADVENT OF COLOUR TELEVISION: 1971". RTÉ Archives. April 18, 2006. Archived from the original on February 4, 2012. Retrieved April 30, 2013. ^ The adoption of color television in Italy (Italian) Archived February 29, 2012, at the Wayback Machine. ^ http://www.paradiso-design.net/TVsystems_worldwide.html World TV standards. 85. ^ https://visions4netjournal.com/admiral-c1617a-color-tv/ Admiral C1617A Color TV, Pittsburg Press, ‘Admiral introduces their first color set in Chicago’, The Cumberland News, ‘Invitation to see Admiral color set’, The San Francisco Examiner, ‘Orders taken on a priority basis’, The Indianapolis Star, ‘Admiral color set at dealer open house’ The New Palladium, ‘Purchase price $1,175.00 installed with your existing antenna’ and The Oakland Tribune, ‘See your first color television at Maxwells’. TV Color Controversy, LIFE February 27, 1950 Article about FCC debating which color television system to approve for US broadcasts.